We had an amazing weekend. It was raw courage at it's best. it's makes you feel so small, and so grateful. This is Charlotte a quadruple amputee. 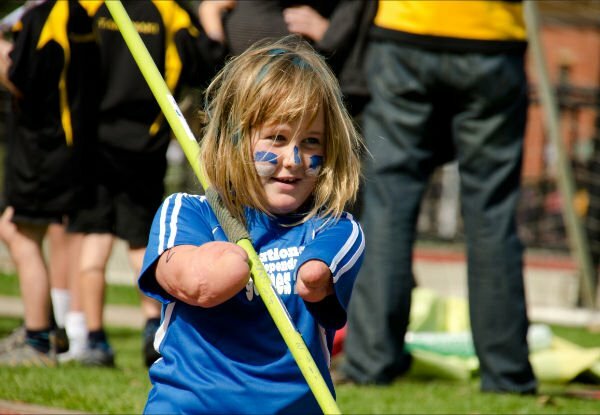 She is one gutsy girl, you can only stand and admire her determination. It was great, more than great. I stayed with the lovely Cat and family and was spoilt rotten. I also met Leoni, Lisa and Natalie. It's lovely meeting other bloggers. and I finally started my ripple blanket with some delicious wool I brought from Natalie. Natalie is a fantastic teacher, if you want to learn I recommend contacting Natalie. I'm loving books waiting for you to open when you get home!! I can't remember where I saw it, but I ordered it off Book Depository. It's a cute book, but actually cute things that I would make. See this? adorable. It's full of things that I want to make. Some books just look cute but you don't want to make them really. This little necklace is lovely too. I'd like to make it for Annie. I'm so grateful for awesome friends who send presents. Annie was sent this adorable bunny make by Jacqui this week. Isn't it fantastic. Thanks so much Jacqui, it's amazing, Annie loves it. We are planning Annie's birthday. It's a birdie birthday, she is adamant. I have a few ideas on my Pinterest board to do. I think I'll make some more with dollies and linen, it's such a nice combination. What's happening at your house this week? ?